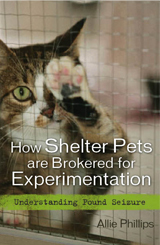 Allie Phillips, attorney, volunteer and author of the award winning book How Shelter Pets Are Brokered for Experimentation, Understanding Pound Seizure, sat down with me to talk about shelters selling pets into research and the story behind it. Having had a cat taken from her arms by what is known as a Class B dealer during her volunteer shift at the local shelter, Allie got to the bottom of what was going on in the industry. Her book gives us a look inside this practice, what must be the worst kind of living nightmare for the animals hauled off to a laboratory. Join us in this lively and informative interview, discover what’s happening in this field and how you can help end this practice. Check out the map of pound seizure States at the book title link — is your State listed? You can check out Allie’s Facebook page here. Rescue shelter pets from animal testing and help end this State-sanctioned cruelty. As much as I did not want to listen to the broadcast, it is running in the background as I type. When I first brought my hound dog home, a gal stopped to tell me what a gorgeous Redtick he is. I told her Valentino came from the local shelter and I was learning all I could about his breed. She then told me about an EX of hers who'd worked for years in a university research lab. It sickened me. Before this I had had no idea such things happened. I don't care what anyone says... shelters involved in this practice, states involved, universities involved... they are just plain wrong, as well as evil animal abusers. So thank you for bringing this to the public's attention! @ruthcox I couldn't agree more. I was horrified to learn of this practice. What an utter betrayal. Thanks for listening to the hard stuff, Ruth!